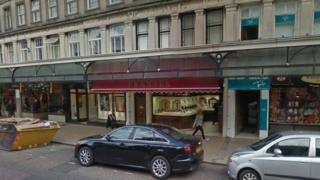 Seven people have been charged after a jewellery shop was targeted in an armed robbery. A group of raiders, one said by police to be wielding a samurai sword, held up Franses jewellers in Westover Road, Bournemouth, on 14 March. No-one was hurt in the raid, in which "a quantity of jewellery" was stolen by men who had been riding mopeds and motorbikes, police said. Officers later stopped trains in the search for suspects. Police said the seven suspects would appear before Poole magistrates on Saturday. Two London men, aged 25 and 27, have been charged with robbery, threatening a person and dangerous driving. A 26-year-old London man has been charged with robbery and aggravated vehicle-taking. A 31-year-old Bournemouth man, a 52-year-old Bournemouth woman, a 26-year-old London man and a 26-year-old man of an unknown address have been charged with conspiracy to commit robbery. Earlier a photo was released of a man police want to speak to in connection with the raid, as well as a robbery and a burglary in London. The Metropolitan Police said Kalan Williamson, 26, of Chelsea, was being sought by officers from Operation Venice, which specialises in investigating moped-enabled crime. Addressing Mr Williamson directly, Ch Insp Jim Corbett, of Operation Venice, said: "I would suggest handing yourself in to the nearest police station sooner rather than later." The force is investigating two incidents in Wimbledon - a robbery at a jewellery shop on 12 September and a burglary at a clothes shop on 6 December.